As we were graduating from college, we kept hearing of friends being offered big jobs with high starting salaries and sign on bonuses and suddenly there was all this pressure, not to find a career, but to land the perfect situation. My guy was then my fiancee, and with his shiny new Business degree came big expectations. It’s interesting how quickly we moved from wanting to make a difference in the world to desiring the biggest and the best. For years I viewed wealth as an elusive vapor, something to be captured and held onto tightly and only available to a select few. Twenty five years later, on the other side of all that, the perspective is so different; I can look back over the years and see what was important to us and our true markers for wealth at various stages of life. When we were first married, we bought the only brand new car we have ever, or probably will ever own. We made big purchases without looking ahead and pushed for promotions. Wealth looked like recklessness and freedom. Then we had a house full of kids, a mortgage and all that comes with those commitments. I can remember walking through our peaceful home in the middle of the night, checking on children and feeling rich, like we were going to be caught squatting in somebody’s house, living someone else’s life. Wealth was clean laundry and a freezer filled with meat. As our children grew and my guy climbed the corporate ladder, it was easy to get caught up in the next big thing; where would his career take us next? We shrugged off the questions and focused on staying in one particular part of the country and committing to relationships and ministry. Wealth was mourning and celebrating with loved ones and raising children who were healthy, happy and safe. Today we are in a season of wealth that is so different than all the rest. Our children are the people who are moving on and making big plans, and trying to determine the importance of success and happiness. Today wealth looks like a full dinner table and the satisfaction that we have done enough. 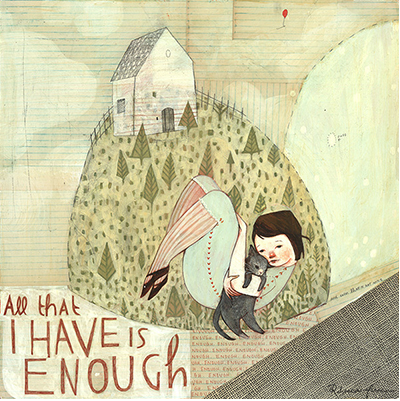 That we are enough. And that we have more than enough. This brought tears to my eyes…awesome post. How the years have flown. I especially love the part about you checking on the kids in the middle of the night and feeling rich in that moment. Beautiful post. Thank you so much for reading! I know you can relate, being in the same season of life. I needed to read this. My husband an I have struggled for every penny we’ve earned. When we saved up enough, we started a business without borrowing. 16 months into the business, we’re just now seeing fruit, which means we can pay our bills without additional income and have even talked about starting a family. Our friends are all earning much more than us. They go on vacations, we stay home. They go out and do fun things on the weekends, we sleep. It’s easy to get caught up in what everyone else has and forget to look at all that God has provided. Sounds like you’re doing a great work! It’s so cool that you both are on the same page, sacrificing for what really matters to you. I believe that God rewards obedience and sacrifice, and would love to hear more about your business.